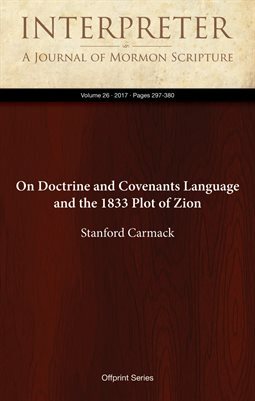 Contrary to the generally accepted view, it seems likely that much of the wording of the Doctrine and Covenants was transmitted to Joseph Smith as part of the revelatory process. Apparent bad grammar and a limited reading of “after the manner of their language” (D&C 1:24) have led to the received view that “the language of the revelations was Joseph Smith’s.” This judgment, however, is probably inaccurate. Abundant cases of archaic forms and structures, sometimes overlapping with Book of Mormon usage, argue for a different interpretation of “after the manner of their language.” Scholars have chosen, for the most part, to disregard the implications of a large amount of complex, archaic, well-formed language found in both scriptural texts.